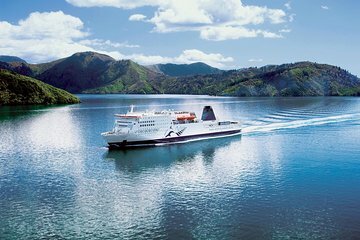 Board the InterIslander ferry in the picturesque port town of Picton, and relax during the 3-hour cruise across Cook Strait on what promises to be one of the most scenic ferry journeys. You’ll travel through the tranquil, shimmering waters of Queen Charlotte Sound, nestled amid lush forest in the heart of the Marlborough Sounds. Leave the South Island behind during daily ferry service to the North Island, where you’ll arrive in port at Wellington Harbour. As New Zealand's capital comes into view, enjoy a unique panorama of the hills surrounding the lively city marked by its Maori and colonial heritage. Disembark in Wellington to enjoy some of New Zealand's finest restaurants, shopping, theater and attractions, including the renowned Te Papa Museum. Note: The InterIslander ferry opyion does not allow travel with your vehicle. Apart from designated areas, smoking is not permitted inside the ship. The InterIslander fleet has 3 vessels: The Kaitaki (carrying up to 1600 passengers), The Aratere (carrying up to 350 passengers) and the Kaiarahi (carrying up to 550 passengers). From Picton, some InterIslander ferry sailing's connect with the Coastal Pacific train service to Kaikoura and Christchurch. The InterIslander ferry sailing timetable is subject to change, without notice. Surcharge applies to additional services including extra luggage, large sporting equipment, traveling with pets. The option of carrying additional bicycles and sporting gear (for example, canoes or surfboards), is an additional cost of $15 per item. If you are traveling with dogs, kennels are provided at a cost of $15, ensuring your pet's comfort and safety, and your peace of mind. There are a limited number of kennels available. The luggage allowance is two (2) items of baggage per person. Additional baggage items may be carried, subject to availability and on the payment of an additional charge. Larger baggage, including backpacks, must be checked in at the Picton terminal. Baggage can then be collected from the carousels at the port of arrival. InterIslander will not accept individual baggage items which exceed either 32 kilograms in weight, or 200 linear centimeters (height and length and width) in dimension. For safety reasons, there are no exceptions to the weight restriction. However, the restriction in dimension is relaxed for sporting equipment. Infants aged 1 year and under travel free of charge. Children aged 2 to 14 years inclusive qualify for the child rate. Youths aged 18 years and under are not permitted to travel in Plus Lounge.